This past weekend plans went off without a hitch, at least on saturday. We enjoyed the Big Flea (noting that people who rip apart old books and matte the pictures in them make a killing!! ), made it to Sunflower where much fake meat was consumed, and then arrived in the nick of time to see Der Golem. For those who attended and enjoyed the music, I think John is going to upload the tracks or sell CDs on cafepress, FYI. Sunday was less on target as my classmates bailed on me and I spent 2 hours at the library studying alone. I've gone ahead and made a LJ feed from my Twitter account so you can be privy to the 140-characters-or-less witticisms or complaints or what have you that I generally send from my phone when I'm trapped. I doubt any of you will add it to your friends list, but there it is! 1. 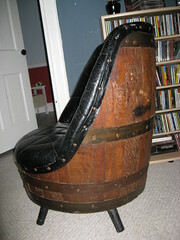 The Barrel Chair Yes, a chair made from a barrel. Only downside is that it's heavy. 2. The Faux Eames Chair Pretty Self-Explanatory. Lacks footrest. Has a few scratches. Please, someone, give them a new home. In band news: Our bassist, my friend from rock camp Olya, is leaving. She is moving to San Fran, and her house sold within a few days of being on the market, so that's not going to delay her. As of December the Jelly Sharks will be looking for a new bassist. Any bassists out there want to be in a band? Anyone want to learn the bass really quick? I am worried I will soon be the only girl in the band. I am trying to figure out a way to make it so that I will pay bills on time. I need a system that promotes timeliness - I have the online thing going on making it easier, but I seem to get around to it every other month, instead of every month. I am still loath to set up automatic payments for fear of a spiralling miserable overdraft situation, unless someone convinces me otherwise. Maybe I'll try putting a monthly thing on my google calendar? If only I could access that from work. *dark looks* If any of you have bothered to read to this point, how do you ensure that you pay your bills on time? Finally, I now have 2 401ks I need to roll over into my new 401k and I am discombobulated about how to do this. I should be worried that the Qwest one is going to asplode soon and make me pay taxes... I wonder why it hasn't yet? Has anyone successfully rolled over a 401k? What should I expect in the way of obstacles? Awesome guys - this is great advice. Thank you so much.